The owners of one of Wales' finest Tudor homes have hit out at Natural Resources Wales after it flooded again. Judy Corbett and her husband Peter Welford have spent about 25 years restoring the Grade I listed 16th Century Gwydir Castle in Conwy. But the couple have been left "broken hearted" and "do not know where to turn" after Wales was hit by flooding. Natural Resources Wales (NRW) said it could not "prioritise this property above other communities". The couple have criticised the environment body previously, claiming nearby flood defence work has made the property more liable to flooding. NRW has denied this is the case. 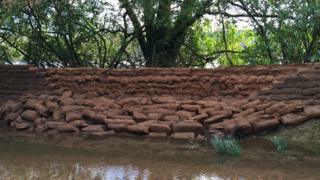 A sandbag wall in the gardens of Gwydir Castle, near Llanrwst in the Conwy Valley, was breached in six places at the weekend, Ms Corbett said. "The waters rose incredibly quickly and it was really terrifying to see," she told BBC Radio Wales. "It was like Niagara [Falls] coming through the gardens. We were inches away from the water coming into the house." The couple now face "thousands of pounds" in repair bills after the gardens and basement were left under water. The house had been due to open to the public on 1 April, but Ms Corbett said this would no longer be possible. She said they had been negotiating with NRW over the Conwy Valley flood defence scheme for 20 years. "We told the authorities that this was going to happen one day," she added. In addition, they have lost about 10% of "veteran trees" which are protected by preservation orders, she said. But NRW said it could not prioritise Gwydir Castle because of its historical significance. "We have every sympathy for the people who live and maintain Gwydir Castle and have been to meet them many times to discuss the issues they face and provide as much support as we can," said Sian Williams, head of operations in north west Wales. "The Conwy Valley flood scheme, which has again worked to protect the communities in Llanrwst and Trefriw, does not increase flood risk for Gwydir Castle. "It reduces the risk and we have shared the data which proves this with the owners of the castle." Meanwhile, parts of Bangor on Dee Racecourse in Wrexham remain under water after the river burst its banks. General manager Jeannie Chantler said they were "keeping fingers crossed" that racing will still go ahead on Saturday. "We have a flood management plan but we can't raise the height of the river bank otherwise it would cause problems further down," she said. "We just have to sit and wait for the river to drop so the water can drain away and then see what damage has been done."